Do you need to clean out the clothes that no longer fit your children? Do you have some baby clothes that you’d like to save? 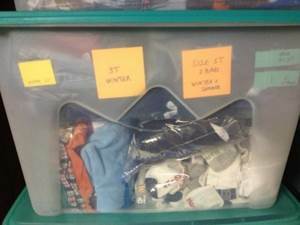 Follow these steps to keep your hand-me-downs organized. Step 1: Go through the current clothes for your smallest child. In this case, I’m working with clothes for two-year old, sizes 24 months and 2T. Is it a sentimental outfit? Would you like to save the clothes for a future grandchild? Can you make something with the outfits? Perhaps a blanket or a quilt with the pajamas? Regardless of the reason, there are some clothes you will want to save. Just be sure to wash them first, and pack them away appropriately so they stay safe. Step 2: Set up new clothes and hand-me-downs from older children. Just unpack the bin with the new size (in this case 3T). Now you’re finished with the youngest child. Do this step right, and you’ll won’t regret it. Group sizes together: all of the size 5 clothes. You can make an exception if a shirt is labeled as 4-6. Determine how it fits, and keep it with that size. In our case, the shirt was labeled 4-6. It ran right in the middle, so we kept this shirt with our size 5 clothes. Step 4: Package up clothes you plan to hand down to a younger child. 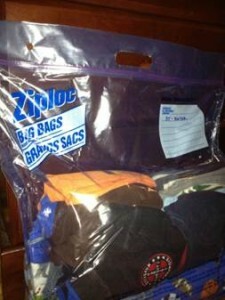 We prefer the Extra-Large Ziploc Bags to store the clothes. You can also reuse the storage bags. Label the bags with a marker. For example: 5T – Winter. If you have clothes for boys and girls, you’ll also want to mark this on the label. Then, put the large bags in a clear plastic tub with cover for safekeeping. Label the tubs so you can easily see the sizes. Put the bins with the smallest sizes on top, since you’ll use these first. This entry was posted in Organization on September 17, 2013 by Running A Household.